Alan Moore isn't going to be involved in this TV project. Alan Moore, one of the most talented writers out there, has worse luck that Stephen King when it comes to big screen adaptations of his work. The League of Extraordinary Gentlemen, with Sean Connery hopelessly adrift in the Allan Quartermain role, failed to make back its development cash, which normally means that the whole shebang vanishes from Hollywood's collective memory. Except maybe not this time, as FOX is about to make a pilot for a TV series based on Moore's Victorian adventure series. 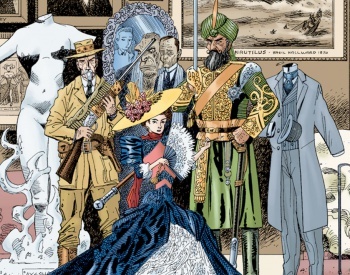 Interestingly, none of the noise from FOX so far has mentioned Quartermain, or his partner Mina Harker; confirmed characters in the series include Captain Nemo, the Invisible Man, Jekyll and Hyde. There's no guarantee that a series will come of this pilot, but - under the terms of the deal - the pilot will definitely be produced and aired. Writer-producer Michael Green and executive producer Erwin Stoff of Matrix fame are the two in the hot seat this time. No word on plot yet either; our heroes - if that's the right word, and yes, Invisible Man, I'm looking at you, or I would be if I could see you - have banded together "to fight a common enemy" according to Variety. Here's hoping it's Doctor Fu Manchu; it'd be too much to expect Martians in the pilot. Alan Moore isn't involved in this project, and it's probably just as well, for his sake as well as ours. This one's in development as of now.